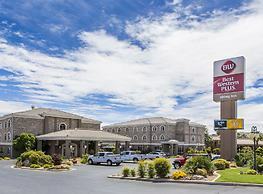 Best Western Plus Abbey Inn in St. George, UT. Make yourself at home in one of the 154 air-conditioned rooms featuring refrigerators and LCD televisions. Your pillowtop bed comes with premium bedding. Complimentary wireless Internet access keeps you connected, and cable programming is available for your entertainment. Private bathrooms with shower/tub combinations feature designer toiletries and hair dryers. Enjoy a range of recreational amenities, including an outdoor pool, a spa tub, and a fitness center. Additional features at this Victorian hotel include complimentary wireless Internet access, gift shops/newsstands, and wedding services. Please mention the STGCON group block when booking by phone to receive the discounted rate. Internet site link will be posted shortly for those wishing to place reservations online. Note: Our block of rooms with discounted pricing is only available until July 13th, which is 3 weeks before the convention. You can also reserve for a day before or a day after at the same rate! Rooms are $84.99 per night.